New puppy owners, be thoroughly prepared when your fur baby joins your family! Other dog lovers, use this curated Dog Supply Shopping List to see what items may be helpful for your current dog. Congratulations on the purchase of your new puppy! Here are all the items that I rely on to give my dogs the best possible care. I recommend that you make these purchases before coming to pick your puppy up for the smoothest possible transition to her new home. If you are not a first time Doodle owner, chances are you have several of the items listed below already. This shopping list is simply a guide for what you might need. Keep your dog's size (both now and in the future) in mind as you purchase supplies, but feel free to choose colors and styles that fit your preferences! We are not suggesting that all of these items are absolutely necessary, but want to give you ideas of the tools we've found to be helpful in our own families and with our own puppies. It is important that your dog eats quality food that supports health and development. I choose to feed and recommend TLC Pet Food for their formula's balance of quality meats, animal fats, vitamins, and minerals. This food aids in the healthy development of your puppy's hips and joints, as well as the skin and coat. It promotes healthy digestion and helps protect against disease and inflammation. In addition, the company will ship fresh food for free to your door. Click the logo to the left to get a $5 off coupon, or if you go to the site directly, enter coupon code 68765-1025. 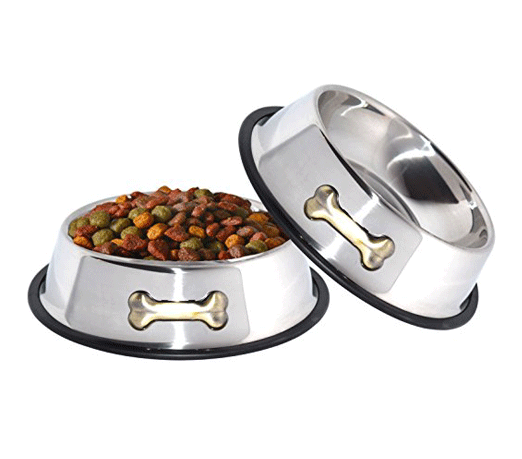 As any dog owner knows, food and water bowls are an absolute necessity. No matter what type of dish you choose, it's important to watch out for cracks that can harbor harmful bacteria. Plastic bowls are not recommended because they can be easily chewed or scratched by your dog. Stainless steel bowls are durable and inexpensive and tend to last a long time. In addition, stainless steel bowls are dishwasher safe and easy to clean. These bowls are great for their cute design and their sturdiness. Why do dogs feel like eating has to be a race? I have no idea, but these bowls seem to fix that problem. Featuring meal-lengthening ridges and mazes, Fun Feeders keep pups engaged for up to 10x longer at chow time, which improves digestion while helping furry friends eat at a fun, healthy pace! The Fun Feeder also features a slip-resistant base to prevent sliding and food spillage. Particularly helpful for larger breeds! It is my goal to keep our furry friends healthy for years to come. This supplement provides full-spectrum nutritional support that focuses on boosting your pet’s immune system and overall health. NuVet Labs are dedicated to offering products for pets that are safe, rich in nutrients and made to strengthen the immune system—helping your pet to live healthy and happy for years. Just as we make sure we have health insurance coverage for other members of our family, I recommend pet insurance. I am grateful for Healthy Paws Pet Insurance & Foundation, which allows you to give your puppy (and other pets) the best medical care possible. Their top-rated pet insurance plan covers new accidents and illnesses including cancer, emergency care, genetic conditions, and alternative care. While I sincerely hope this will never happen to your pet, you'll never know where pests are lurking. For dogs that don’t like to take pills and owners who don’t like to administer them, Seresto kills and repels fleas and ticks for 8 continuous months in one easy-to-use, non-greasy, odorless collar. Quickly kills fleas within 24 hours of initial application and reinfesting fleas within 2 hours. The Seresto collar is water-resistantand remains effective following a shampoo treatment, swimming or after exposure to rain or sunlight. For large dogs over 18 lb - check out this version instead. If you find that you do have a pest problem, I would recommend this control spray that offers prevention and treatment in one safe, effective spray. As an alternative to monthly chemical treatments like drops and pills, this spray is the natural flea and tick treatment that both kills and repels with no toxic effects to pets or children! Plus, it also stops itching and scratching, comforts dry skin and hot spots, and is pH balanced for healthy skin and a fresh smelling coat. Wondercide natural flea, tick & mosquito control kills the flea lifecycle. Use on your pets, bedding, carpeting, upholstery, and other surfaces around your home to ensure full elimination anywhere adult fleas may have jumped and eggs may have fallen. In addition, it will not stain pets, furniture, or flooring. Keep your beloved pet comfortable with this inflatable collar cone. If you've ever had to put your dog in a plastic cone, you would understand how wonderful this product is. Particularly helpful during injuries, rashes, and post-surgery, this keeps your pet from scratching or biting sensitive areas. In the meantime they can still see, eat, drink, sleep, and play normally. This collar is made of a soft fabric that is machine washable. A professional alternative to the "come of shame", this onesie protects wounds, sutures, hot spots and helps to keep it dry. The design is based on the animal’s shape and anatomy with a snug fit as result. It is manufactured using a breathable stretchy Cotton/Lycra fabric, giving complete freedom of movement without compromising strength or durability. Several of our families highly recommended this item as a must-have! The general rule for dog collars is they should be snug with enough room to fit two fingers between your dog's neck and his collar. The collar should not be too loose to slip over the pet's head, nor too tight as to restrict breathing or cause coughing. For everyday use, a Nylon or Leather collar will work. For your first collar, we recommend you purchase a collar that fits at one of the smaller settings but has plenty of room to grow. Check collar size frequently on growing puppies. Have fun with all the available colors! Once you have your furry friend, you want to ensure it has a way back to you if lost. Dog tags come in several different shapes and colors. Make sure the material is durable and readable. I would highly suggest that you include some contact information, like a phone number and/or an address. Your dog will need plenty of exercise to keep healthy and out of trouble. Dog leashes are available in a variety of fabrics, widths, and lengths. Selecting a particular leash for your puppy is based on your preference and budget. The most important factor is that the weight of the leash should correspond with the size of your dog. For example, a larger dog might require a heavier, sturdier leash. While there are also retractable dog leash options, I recommend starting with a standard dog leash when training for better control. A dog harness helps with control and safety issues. A harness can give you more control with your dog when you are out and about. You will want to find one that has an adjustable neck and chest so that it is easy to put on and off. I would recommend a harness especially if your dog has neck problems since the harness disperses the pressure from one smaller area to a larger surface area. Suitable for occasions like daily walking, outdoor, training, and more. For dogs who tend to pull, the Zero Shock Leash has been designed to drastically reduce strain and pull on the dog and the owner. 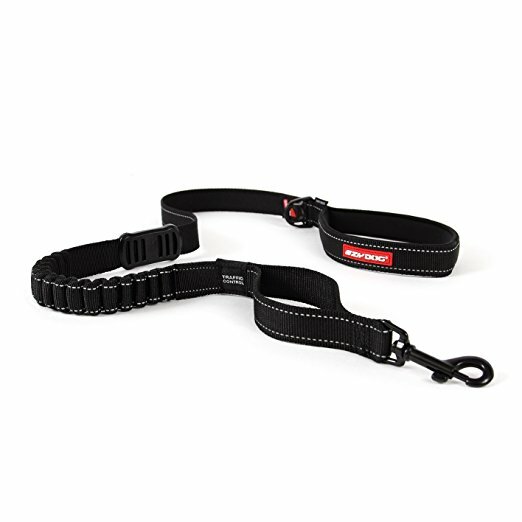 Utilizing a soft touch webbing and a generously-sized neoprene handle, this leash really is a pleasure to hold in your hand and is perfect for walking and jogging with your dog. It adds protection from sudden moves made by you or your dog, a need still in demand well beyond the training stage. I find the control handle near the collar to be very helpful to regain quick and secure control of your dog when required. These leashes are sturdy, durable and soft, made from genuine Full Grain leather and are beautifully finished. 6 foot is the standard recommended by professional dog trainers around the world. It is strong enough to handle very large dogs, but light enough that even smaller dogs will be comfortable with the weight. The high quality finished leather is water resistant, cleans easily and won't tear at your hands like cheap nylon. One of the families that got a Crockett Doodle puppy from us highly recommended this particular dog harness. Her dog hated any of the previous dog harnesses and wouldn't cooperate. When her vet suggested she try this one, her dog now allows her to put it on and is so excited to go for a walk. This dog harness is chafe-free, easy to put on, and simple to use. It stops your dog from pulling and prevents heavy rings, sliders, and sharp areas from chafing your dog. Do you find yourself frenzied while preparing to head out the door with your pet knowing you'll have to take care of any messes left behind? Now there's one less thing to worry about with this 300 count of dog-waste bags, which comes complete with a handy black dispenser and a sturdy leash clip. To use the dispenser, simply remove the base, slip the roll of dog-waste bags inside, and reattach the base. The bags measure 13x9 inches in size and are leak-proof bags for safe, sanitary handling.The dispenser also includes a leash clip so you can attach it and always have it with you. Your new puppy needs a clean, supportive place to sleep. We use Kuranda Dog Beds for our dogs . They’re easy to keep clean, supportive and best of all, they’re guaranteed chew proof. Because it’s an elevated bed it has the added benefit of being the best tool to have if you train your dog to "Go-To Place". If you plan to purchase a Kuranda bed, use any of our links to the Kuranda website and 5% of your order will be donated to Warrior Canine Connection. This is a wonderful organization that trains dogs to be companions to War Veterans with PTSD. For dogs that are 20 lb or less, we recommend a 30" x 20" bed. For dogs that are about 25 to 40 lb, we recommend a 35” x 23” bed. For dogs that are about 40 to 55 lb, we recommend a 40” x 25” bed. For big dogs that are about 55 to 80 lb, we recommend a 44” x 27” bed. For great big dogs that are about 80 lbs and larger, we recommend a 50” x 36” bed. If you’re going to use a crate, it’s best to put a bed in the crate that the dog can’t chew. You also want one that’s supportive and comfortable for your dog but also easy to clean up if your puppy has an accident. Kuranda makes a great Crate Bed that does all of this. For smaller crates at least 30” x 19” or larger, we recommend the 28 5/8” x 18 1/2” bed. For medium crates that measure at least 36” x 23”, we recommend the 33 3/4” x 22 1/8” bed. For medium crates that measure at least 42” x 28”, we recommend the 41” x 27” bed. For larger crates that measure at least 48” x 30”, we recommend the 47” x 29” bed. For XXL crates that measure at least 54” x 37”, we recommend the 50” x 36” bed. your order to Warrior Canine Connection. This memory foam bed is designed for lasting comfort and easy care. High quality orthopedic memory foam eliminates pressure points, while a soft yet durable fabric cover offers comfort. The shredded memory foam allows for better airflow between foam clusters for a cozy, breathable sleep surface. For easy care, the plush cover is removable, machine washable and dryer safe. Simply unzip the cover to remove and and voila, just throw it in the wash! A fluffy-soft fleece cover offers year-round enjoyment with a softness that pets will gravitate to. This dog bed is machine washable, a definite plus. A padded dog bed is ideal for crates, carriers, doghouses, and other pet homes. The gentle padding underneath is particularly soothing for stiff joints. The bed's lightweight, portable design means it's easy to take along wherever you go. In addition, you can have the mat beautifully imprinted with the dog’s name in your choice of 6 fun and original fonts! Made of high quality microfiber fabric, this lightweight blanket can be stored in your car or at home. These lovely dog blankets are very soft, super cute, and warm—perfect for adding a little more extra comfort for your pet. Not to mention extra protection for your couch, carpet, car, bed, floor, or chair. And the best part? They're machine-washable. You may need a lightweight cover for wire crates to provide the privacy, security and comfort that dogs instinctively need and desire. These crate covers were designed to create a more "den-like" atmosphere for your dog which can help reduce anxious behavior such as barking and chewing. Made of 100% polyester, these covers have Velcro attachments for each side flap to fit firmly over the dog crate. They are also machine wash / dryer friendly for easy cleaning. If you prefer to keep your dog close at night, you might consider a decorative yet functional pet crate end table that will beautifully complement your home’s decor. This dog crate has a stained and lacquered finish just like fine furniture. The durability of mortise and tenon construction adds strength to the dog crate. The door can be fastened shut with a secure, stainless steel latch and can be rotated inside to provide access for pets while providing the benefit of being out to the way. The melaminefloor is waterproof, which eliminates the absorption of liquids and odors, a very important feature for homes and pets. The metal exercise pen provides a great enclosure to keep your pet safe and secure while indoors or outside. These playpens are made of durable metal wire with a coat finish for long lasting protection against rust and the elements. 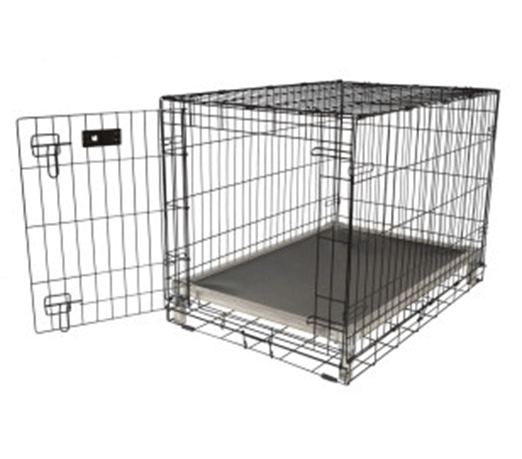 When fully expanded, this provides your pet with 16 square feet of enclosed living area. It is simple to set up, with no tools required. This is a good solution if you want to give your pet more freedom to move about, play, and keep those muscles working, but don't want them to have free rein. A properly exercised pet is a happier, healthier pet. A slicker brush is handy for fluffing the outer coat on your Crockett Doodle. A slicker brush is simply a brush that's dense with very thin, strong and bendable pins. These hundreds of pins close together work at separating hairs, which de-mats your dog as you brush. In the long run, it is better to get a good quality slicker brush because cheap brushes have handles that tend to break, bristles that wear out quickly, and their pins tend to be stiff and sharp which can hurt your dog. Using the right tool will speed up the grooming process significantly and make it a more pleasant experience for both you and your Doodle. This tool is used to remove any of those hidden mats the slicker couldn't reach. The comb is dual-sided with coarse, fine teeth and is an essential tool for finishing and fluffing coats. It's perfect for finishing your dog and making sure they're 100% clear and free of tangles. You need to trim your dog's nails regularly to prevent nail overgrowth, injury, and discomfort. There are several different kinds of nail clippers on the market, like Scissor clippers (for bigger size dogs), Guillotine clippers (small and medium size dogs), and Grinder tools (all sizes). The grinder works by grinding down the nail instead of clipping. It's worth noting that the grinding process takes a bit longer than the clipping process, so patience is required. Grinding also tends to leave a smoother finish on the nail. Keeping your dog’s or cat’s coat brushed regularly is important for their overall health, as well as yours. These gloves make it easier and more efficient than ever before! This flexible, slip-on grooming gloves allow you to brush away dirt, grime, dander and loose hair from cats, dogs and horses of all shapes and sizes. It also helps stimulate the healthy oils on their skin which can improve the softness and radiance of their coat. You'll be amazed how well these work! This puppy shampoo is specially formulated to be hypo-allergenic and PH balanced for the delicate skin of puppies and kittens. It is environmentally safe and created to moisturize your young pet’s sensitive skin and give their coat sheen and luster. Our shampoo contains a coconut base with aloe vera, vitamins A, D, E and a proprietary blend of botanical extracts; no alcohol or animal by-products are ever used. This puppy shampoo is tearless and contains no detergent or soaps that remove the essential natural oils from the skin which your pet needs. Puppy pads are perfect for training your pets to piddle. This mat will protect your house from damage and dirt on the floor. Puppy training pads make dog training easier and make life happier. Theres's a built-in attractant that your pet will fall in love with, making it preferable to do their business on the mat rather than anywhere else. Puppy training pads have odor-control so they keep your room clean and smell fresh all day. You can use the pads anywhere, like the floor, bathroom, crate, carrier, etc. Your puppy will inevitably have accidents in your home. Be prepared with a pet stain remover that cleans tough spots and stains with ease. You need a product that is tough on stains but not harmful for your dog or your carpet. A spray bottle makes clean-up quick and easy. Always follow product recommendations for checking color-fastness before usingon your carpet or upholstery. The Kong is the gold standard of dog toys and has become the staple for dogs around the world for over forty years. Offering enrichment by helping satisfy dogs' instinctual needs, the Kong unique all-natural rubber formula is ultra-durable with an erratic bounce that is ideal for dogs that like to chew while also fulfilling a dog's need to play. Want to extend play time? Be sure to stuff with tempting bits of kibble and entice with a dash of peanut butter. Puppies don't chew up your house just to drive you crazy; they're driven to ease sore gums and try out developing teeth. Redirect your little canine's chewing urges with this adorable, pacifier-shaped chew toy. 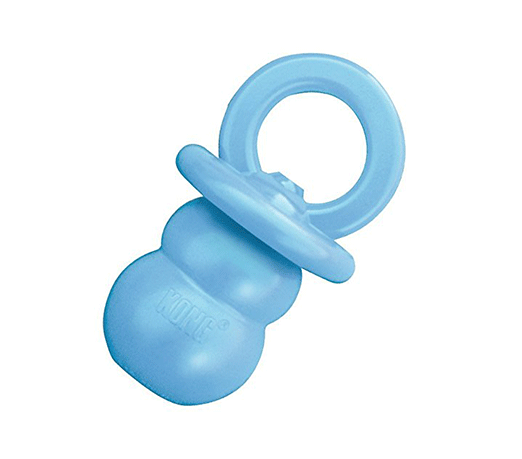 Made from an exclusive puppy Kong rubber formulation that's more flexible than regular Kongs, these binkies soothe teething pains and encourage healthy mouth and jaw development. They also help puppies learn the appropriate way to channel their chewing urges--an investment that will pay off over the entire lifetime of the dog. And just like the beehive-shaped Kongs, these have a goofy, unpredictable bounce for hours of chasing and fetching fun. Dental health is just as important for pets as it is for people, but it's a rare dog that likes getting his teeth brushed. This fun, versatile chew combines the functions of a treat dispenser, toothbrush, and classic fetch toy, all in one. Made from the same super-tough, puncture-resistant natural rubber as classic Kongs, its patented grooved design "squeegees" teeth and gums clean as dogs chew, helping prevent plaque and tartar buildup (not to mention bad breath). Use Kong Breath Paste inside the grooves to motivate your dog to chew and freshen his breath at the same time. Shaped like a bone, Kong dental toys have a hollow interior just made for stuffing with treats or biscuits. Extracting the contents is work that can keep dogs happy and busy for hours, helping prevent boredom, separation anxiety, and related behavior problems like barking, digging, or chewing shoes. Dogs are very playful and intelligent animals. Channel their energy and curiosity into something positive with trixie's flip board. It is ideal for the intermediate canine gamer. The game rewards your pet for correctly opening the various compartments. To begin, place your dog's favorite treats in any or all of the compartments. By correctly sliding the covers or lifting the flaps and cones, the rewards will be revealed for your dog's enjoyment. Due to our unique design, the cones cannot be knocked over. They must be lifted straight up to be removed. Vary the number and placement of treats to increase the level of difficulty. The non-slip rubber rim keep the game in place as your dog explores. We have also included an instructional booklet with tips and tricks for challenging and training dogs of all ages through play. The Kong Squeakair Ball combines two classic dog toys—the tennis ball and the squeaker toy—to create the perfect fetch toy. Our durable, high-quality tennis ball will not wear down your dog's teeth. It's made with a special non-abrasive felt, compared to the abrasive material on normal tennis balls. Perfect for games of fetch. Doodles, especially puppies, tend to be active and need toys to play with. 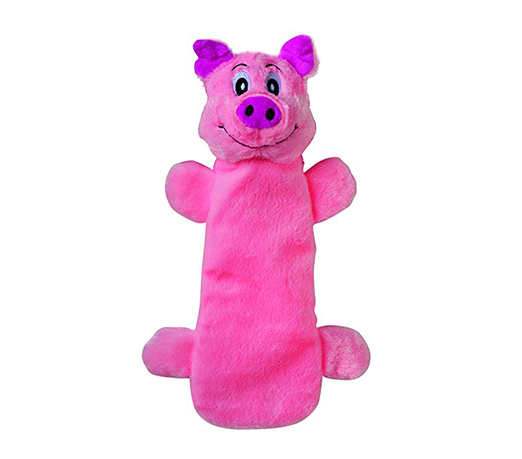 Purchase cute, soft and cuddly plush toys that are made with an extra layer of material to make them extra tough. These are perfect for a game of fetch or great as a comfort toy for your furry friend. It’s difficult to find a plush toy that can withstand rough play that will last for more than one day. It’s even worse to find a huge mess that your dog made by tearing apart a new toy. If you're a dog owner and really want to find a toy that your dog loves, but that lasts more than 5 minutes, tender-tuffs are the answer you've been looking for! Simply insert an empty plastic bottle for hours of fun with added crinkle action. This deliciously entertaining chew toy has allergen-free peanut butter flavor throughout. Made with tough, durable nylon, this Power Chew DuraChew chew toy is the long-lasting chew toy you need for your aggressive chewer. This power chew keeps dogs busy, satisfies their natural urge to chew, and encourages positive chewing habits. Plus, the bristles raised during chewing promote clean teeth and help control plaque and tartar buildup. Variety of flavors including bacon, peanut butter, beef jerky, and chicken. OraVet Dental Hygiene Chews combat bacterial attachment, the starting point of plaque, calculus and halitosis. Each chew releases delmopinol HIC, an ingredient that coats the teeth, tongue and gingiva to create a protective barrier against the bacteria that cause bad breath and are the basis for plaque. OraVet Dental Hygiene Chews also break down existing plaque and then effectively remove plaque and calculus through mechanical action. OraVet Dental Hygiene Chew should be given as directed by your veterinarian as part of your dog's complete preventive oral health care regimen. Always monitor your dog until the chew is fully consumed. Chews are intended for dogs six months of age and older. Bully sticks are fully digestible so they make a better treat for puppies than rawhide to satisfy their need to chew. They are made of one ingredient—beef. Because bully sticks are made from tissue that is fully digestible, it is a safe alternative to antlers, which can break teeth, rawhide rolls, which can cause blockages, and cooked bones which can splinter. No growth-hormones and no cheap fillers. To prevent loose stools because of a quick change in diet, introduce slowly to avoid tummy upset. TLC Whole Life Health Biscuits with Glucosamine & Chondroitin will maintain their optimum body weight and nutrition levels while protecting joint and skeletal health. There are no by-products or chemical preservatives added, just all-natural ingredients that are fortified with vitamins and minerals to promote the overall health of your pet. The fine chewing particles of Whole Life Health Biscuits naturally scrub and clean the tooth surface, leaving shiny teeth and fresh breath. Treat your puppy with all-natural, premium beefy bites that’s 100% meat, healthy, nutritious and better than anything else out there. YumYum Puppy Savory Beefy Bites are made with premium USDA inspected beef, completely free of fillers, binders and unhealthy chemicals that’s found in most dog foods. Each freeze-dried piece is the perfect reward for training puppies and dogs of all ages. They’re consistency make them easy to chew for young and adult dogs alike. Whether you’re going to the vet or on a flight across the country, traveling with your dog can be stressful for you both. This medium-size carrier expands on the front, back & sides to give your pet a roomier, more comfortable travel experience in a car or underneath the seat of an airplane. Check with your airline for specific travel requirements, but we can say if your pet doesn’t fit in this, they can’t fly under your seat. Designed to keep your pet safe, secure, and comfortable when traveling, this kennel works well for anything from trips to the dog park or hiking trails to routine visits to the vet. Featuring an easy 2-door entrance, you're sure to get your pet in and out without hassle. Be sure to add a cozy blanket or a soft foam bed for comfort. Quickly provide fresh water for your thirsty pups without a dog bowl. Squeezing water from bottle to the flip-up silicone provides a drinking space for your dog to lap water. Easy storage in your backpack, bag or glovebox. Also includes an adjustable pet seatbelt for happy travels. A car seat cover allows you to bring your pet with you anywhere without worrying about any damage to your vehicle. With 4 layers of durable materials, this car cover is waterproof and wearproof, keeping your car safe from pet claws, stains and liquids. The cover can be securely anchored in the back seat, making sure it stays still and neat even during quick turns and speed bumps. Available for most cars, trucks, automotives and SUVs. If you're planning on traveling by air, this carrier allows your pet to travel with you on most major airlines.You can roll it through the airport like a traditional piece of luggage, or you can convert it into a backpack to get places faster and easier. You want one that is ventilated, made with high quality mesh, has openings for your dog or cat to view the world with you as you travel, and has memory foam fleece inserts on the inside, all to keep them happy and comfortable during your journey! A high quality portable playpen makes it easy to take your pet to wherever you go. Set up a convenient home-away-from-home in moments—perfect for travelers and campers. The playpen can be folded to put into the Carry Bag. Because of the durable, water-resistant fabric and mesh panels, this pen is comfortable and easy to clean up. How do dogs perceive the world about them? How do they see, hear, learn, relate to their owners? How large are their brains, what is their emotional makeup? Why do they suffer from stress and how can it be coped with? Over the last few years a substantial body of knowledge has been built up about the psychology of dog behavior. Combining more than twenty years of practical experience as a veterinary clinician with a personal knowledge and understanding of the latest international research, Dr. Bruce Fogle has written the most inclusive and relevant book on how the canine mind works. In Cesar’s Way, Cesar Millan—nationally recognized dog expert and star of National Geographic Channel’s hit show Dog Whisperer with Cesar Millan—helps you see the world through the eyes of your dog so you can finally eliminate problem behaviors. Taking readers through the basics of dog psychology and behavior, Cesar shares the inside details of some of his most fascinating cases, using them to illustrate how common behavior issues develop and, more important, how they can be corrected. The writers of this book draw on their experience as long-time breeders of German shepherds and as trainers of dogs of all breeds to provide the indispensable information and advice that every dog owner needs about dog training, canine behavior, and the animal/human bond. This new edition features new photographs throughout, along with updated chapters on play, crating, adopting dogs from shelters and rescue organizations, raising dogs in an urban environment, and the latest developments in canine health and canine behavioral theory.